Żebbuġ (Maltese: Ħaż-Żebbuġ) [ħazˈzɛbbʊtʃ], also known by its title Città Rohan, is a city in the Southern Region of Malta. It is one of the oldest towns in the country, and its population is 11,903 as of March 2014. The parish Church is dedicated to Philip of Agira and the feast is celebrated on the 2nd Sunday of June, although the actual feast day falls on the 12th day of May. 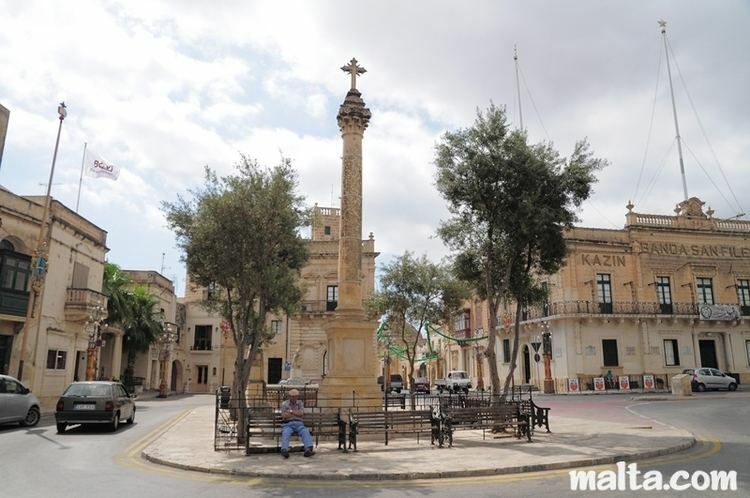 The name of the town literally means "olives" in Maltese; it derives from the large olive groves that stood in and around the current location of the church and the centre of the town. The town was bestowed with the title of Città Rohan by Emmanuel de Rohan-Polduc, the Grand Master of the Order of St. John on 21 June 1777. As was the custom in such events, the people of Ħaż-Żebbuġ built an archway known as the De Rohan Arch at the entrance to their hometown by way of marking the incipiency of its status as a city. The gateway, also known by the locals as Il-Bieb il-Ġdid (Maltese for The New Gateway) still stands today. The town's coat-of-arms is also based on that of the House of Rohan. In 1380 a church dedicated to St. Philip of Agira was built in Casal Zebugi, a tract of land situated in the middle of the small communities which had developed during the previous Arab occupation of Malta, namely Ħal-Dwin, Ħal-Muxi and Ħal-Mula and which were eventually joined together forming the village known till today as Ħaż-Żebbuġ. Filippo de Catania "il-Kataniż" (Philip of Catania) a wealthy entrepreneur owning land in Ħaż-Żebbuġ funded part of the construction of St. Philip Church built on his own land. Long years after it became the parish church another one, designed by Tumas Dingli, was erected in its stead in the late seventeenth century. The church boasts a magnificent titular painting by Luca Garnier and two spectacular murals by the great Maltese 18th Century painter of the Favray school, Francesco Zahra, which critics consider to be his best works. Among other treasures the Church possesses an artefact attributed to Guido Reni and several others by Antonio Sciortino. The statue of St. Philip, by sculptor Luigi Fontana, was created in 1864 and is regarded by connoisseurs as the most beautiful of its genre in the country. When Malta was an independent principality under the sovereign Order of St. John, Ħaż-Żebbuġ was among the chief towns after Valletta and Mdina, first because of the presence of leading corsairs among its inhabitants, subsequently due to its major role in the cotton industry. The magnificence of St Philip's Church is the foremost evidence of the pre-eminent place Ħaż-Żebbuġ enjoys in Maltese history. The locals or Żebbuġin as they are known in Malta are renowned for their business acumen amongst others, and there is a local saying to this end. Due to the Żebbuġin's Francophile past, the town was regarded as a friendly community when the Revolutionary French took Malta. During their rule in Malta (1798-1800), the local churches were plundered for their riches in order to fund Napoleon's campaign. The Ħaż-Żebbuġ locals opened the main door to the church when they heard the French were coming and hastily hid the gold and silver religious iconography. When the French saw the open doors of the church they kept on going and the Żebbuġin retained their religious riches. Malta is very rich in archaeological remains and Ħaż-Żebbuġ is no exception. It gave its name to an era of prehistoric time when pottery of a kind not known as yet was found in tombs in the area known as Ta' Trapna. Later archaeological finds constructed at around the same time were subsequently known as "Żebbuġ phase" remains. A scattering of Punic and Phoenician tombs were also found together with a small number of cart ruts and other remains. Ħaż-Żebbuġ is renowned for its spectacular festas dedicated to the Patron Saint St. Philip of Agira and to St. Joseph, a secondary feast. There are three band clubs in Ħaż-Żebbuġ, all of which have respective fireworks factories: De Rohan Band Club (established in 1860), St. Philip's Band Club (established in 1851) and the 12 May Band and Social Club (established in 1961). Ħaż-Żebbuġ is the birthplace of various prominent Maltese personalities who have adorned the national cultural history down the ages, such as Mikiel Anton Vassalli (father of the written Maltese language), Dun Mikiel Xerri (patriot), Francesco Saverio Caruana (Bishop and Pariot during the French period, Nicolo Isouard (composer), Dun Karm Psaila (Malta's national poet), Antonio Sciortino (sculptor), Lazzaro Pisani (painter), Frans Sammut (leading contemporary author), and Alfred Chircop (foremost contemporary painter). Ħaż-Żebbuġ is the locality where the French Ambassador to Malta lives in what used to be previously the Palazzo Manduca. The Grand Chancery of the Hospitaller Order of Saint Lazarus of Jerusalem is also situated in the city. The Zebbug Local Council, which represents the Zebbug residents, joined the European Forum for Urban Security and, in 2011, was elected to the EFUS Executive Committee.